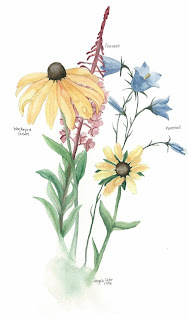 Alaska Highway Wildflowers - the first painting I exhibited. I've posted before about how important it is for artists to be a part of a community. These days, it's easy to connect with kindred souls online, and there are many active forums for artists to critique each other's work, network, brainstorm on marketing, and rant about the artist's life. However, if artists limit themselves and seek community only online, they miss out on a lot. Sure, the internet opens up the artist to a world of potential customers, rather than a small local client base, and any artist with a bit of knowledge on web design or blogging can represent themselves, rather than relying on galleries or juried shows to provide exposure for their work. But community art venues provide some things that are rarely found online, and is extremely valuable. A standard of measurement. When I started to get serious about painting, I wasn't sure where I stood. I thought my art was pretty good, and my family was impressed, but was it gallery-worthy? Joining a local art society and exhibiting with the other members meant I received feedback from people who knew about art and could view my work with an unbiased eye. Courage. If someone visits my online gallery and hates my work, they leave the site. If one hundred people visit my site and hate my work, they leave the site. I never hear about it. It takes courage for me to stand in a gallery beside my painting and claim it as my own. I've had many an interview with a store or gallery owner, asking them to consider representing me or hosting a show, and it's really hard. But I'm getting pretty good at it - because I have that standard of measurement - I've seen what I'm competing against and I know what I have to offer. And I can take rejection, because I've experienced it and know it's not the end of the world. It's almost always done kindly. A voice. I can write artist's statements all day long, but there's no one asking questions. Being able to hold a conversation with anyone about what I do takes practice, and shores up that courage that's so necessary. I've started a dialogue with a possible patron, and I have seen their attitudes change from polite aloofness to warm interest because of how I presented myself. You don't get that second chance with online sales. Venue. If you feel gutsy and can think outside the box, your community can offer some great exposure for your art. I've asked and been granted permission to exhibit at garden shows, library events, clinics and home decor stores. I also have work in the local art gallery's art rental program, and I have seen other artists' work exhibited in vacant storefronts as part of a downtown revitalization program. Cheerleaders. I live in a small town in a small community. Everyone knows everybody, or if they don't, they know someone who does. The other day I was at the post office mailing out a painting. The lady behind the counter saw my name, and the painting on my personalized address label, and told me she owned two of my paintings. I'd had no idea - they were pieces I had donated for a local art auction. Who knows more people than a small town postmistress? And how likely do you think it was that she talked about me to the other employees after I'd left the building? Word of mouth is free and small towns do it well. Over the years I have made contacts and sold paintings to real estate agents, teachers, doctors and churches, to name a few. Not only do they like my work, but they love the fact that I am local, and can pat themselves on the back for supporting a local girl. If you live in a larger centre, find a way to make your pond smaller. Cities are just clusters of smaller communities. Work on building a presence in the immediate vicinity, or network among your existing community of friends, coworkers, and acquaintances. Find out where the artistic people dwell and infiltrate their gatherings. Be consistent about it, and make yourself useful. I got to know a lot of people when I was an active contributing member of the art society. I love introducing myself and hearing the reply, "Oh, I know you - I love your paintings!" You can't do that online - at least not until you're quite famous. And finding your place as an artist in your own community is a great place to start.